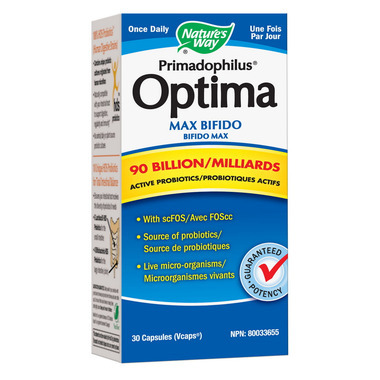 Nature's Way Primadophilus Optima Max Bifido provides 90 billion CFUs of a 10-strain blend of probiotics specifically for adults. This blend has a higher potency of bifidobacteria for colon health and helps to replenish bifidobacteria levels that decline with age. True Potency: The potency of CFUs claimed on the label is fully guaranteed until expiration, not just at time of manufacture. True Release: Every Primadophilus capsule is specially coated to ensure optimal survival in stomach acid and proper release into the intestine. True Identity: Only the probiotic strains listed on the label make their way into a Primadophilus product. Directions: Adults: Take one capsule per day. If you are taking antibiotics, take capsule 2 or 3 hours before or after the antibiotics. Warning: Consult a health care practitioner prior to use if you have nausea, fever, vomiting, bloody diarrhoea or severe abdominal pain. Discontinue use and consult a health care practitioner if symptoms of digestive upset (e.g. diarrhoea) occur, worsen, or persist beyond 3 days. Contra-Indications: Do not use if you have an immune-compromised condition (e.g. Aids, lymphoma, patients undergoing long-term corticosteroid treatment). Notes: CFU = Colony Forming Units. NutraFlora® is a registered trademark of GTC Nutrition. To retain maximum potency, keep refrigerated after opening. Please be advised that Well.ca follows manufacturer guidelines for storing & shipping probiotics. This product will be shipped with an ice-pack to maintain product efficacy.